Meetings are usually held to assign action items or tasks related to a particular activity and to track their progress. These action items should not just be a mental note but it needs to be recorded to make task management easier. Failing to write down your tasks or action items following a meeting makes accomplishing anything extremely challenging. Not recording these will lead to action items being forgotten which in turn leads to another meeting to discuss the same tasks again. This clearly is a huge waste of everybody’s time. What goes in the action item? Wizergos not just makes it easy to record these tasks but goes one step further by sending automated to-do list emails every morning. The current business climate demands higher productivity and efficiency. Maintaining a to-do list or an action item list to organize your day, week or month is one of the fastest ways to get there. 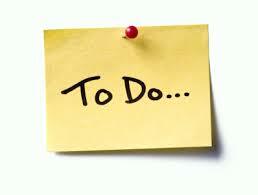 An automated email every morning from Wizergos ensures that you know what’s on your to-do list and keeps you organized. And, if you are the manager or the meeting organizer who assigned the action item to your reportees, you will be notified if there is a delay in the completion of an action item, also, the reason behind the delay in the comments section as well as upon completion of an action item.